Do you bake your bacon? I do. I make this Buffet Style Oven Baked Bacon all the time and have for years. My whole family thinks I’m nuts – until they see how easy it is and how little mess there is to clean up. The real clincher, though, for them (and me) is when they see how this Buffet Style Oven Baked Bacon looks. When they see how beautiful each piece cooks up, how the bacon is all uniform and straight and pretty much the same from top to bottom and side to side. And they’re always surprised how Buffet Style Oven Baked Bacon cooks up with no mess, spatters or bother with hardly any cleanup and no standing over the stove, babysitting like there is when cooking bacon in a pan. I have to put buffet style bacon on my blog, though, even though it isn’t a new or unique idea because I pretty consistently find myself having to google up a recipe! I can’t seem to remember from time to time what temperature and how long to bake it at. Getting old has its advantages but this memory thing isn’t one of them! So, for me (and maybe for you) here is my “guide” for my Buffet Style Oven Baked Bacon. I pretty much always bake my bacon all the time now. About the only exception is when I just need slice or two, or maybe when I’m just doing a quick recipe that calls for only a few bacon crumbles, then I dice it up and do it on the stove. Honestly, though, often when I just need a little bacon, I’ll make my Buffet Style Oven Baked Bacon anyway, and just plan on serving BLT’s for lunch or dinner. We do love our BLT’s here, especially if we have home-grown tomatoes. And I just made the Buffet Style Oven Baked Bacon recently when I made Light Hot Brown Sandwiches. That is them in the photos, below, just waiting for their cheesy, saucy topping. There are some variables when making the Buffet Style Oven Baked Bacon. One, of course, is how hot your oven bakes and how the air circulates around in the oven. The other is the actual thickness of the bacon. And the last, of course, is your own personal taste. I was actually at a camp-out when one of my friends was making the bacon – and asked me how I liked my bacon. I was so impressed. I had never been asked that before! My answer? Crisp, but with a bit of chew! I think we all have our personal preferences and of course sometimes when you make a recipe you’ll want very crisp bacon and for others, you might like the bacon a little chewier. There are no worries with the Hotel Style Oven Baked Bacon because the bacon will be done consistently with every piece the same, no turning and fussing and taking some off before the rest. Just put it in the oven and let it go. Just watch at the very end and pull it when it’s ready. Timing can be different, too, with different kinds of bacon, thick or thin or maybe different brands. If you have a “usual” brand, just jot down your exact time it takes the bacon to get to your desired doneness. Then you can rely pretty much totally on the timer. The first time you make Buffet Style Oven Baked Bacon, though, you’ll have to watch it towards the end to get it just right. And did I mention clean up is a breeze? After you remove the bacon from the pan, just make a little “Spout” from one corner of the foil. Drain your grease out into a container of choice. If I’m not saving it for something, I like to drain it into a can, refrigerate it and dispose of it after it hardens. You really don’t want to be putting bacon grease down the sink. Did you know that bacon is often on sale (often with coupons from the producers or from the store) around Holidays? And that it freezes very well and doesn’t take up a whole lot of space? So there you, go, stock up when it’s at a low. 🙂 Sometimes during holiday sales, especially holidays that are well known for brunches, like Easter or Mother’s day, you’ll find bacon or sausage “bundled” at a sale price if you purchase other items like eggs or pancake mixes. Make sure that the prices are better than they are if the items are purchased on their own. Bacon’s a great value at both Aldi and Costco. Aldi, in particular, has three or four different grades. The cheapest never has great slices. They are oddly shaped, break apart as you try to peel the slices off and don’t cook evenly, so if your serving in a way that features a slice or two of bacon, don’t choose that. That cheapest bacon is fine for recipes where the bacon will be chopped into pieces and used in or to top a recipe, though. This is a method more than a recipe. Start with a cold oven. Line a baking sheet with rimmed edges with foil for easy cleanup. 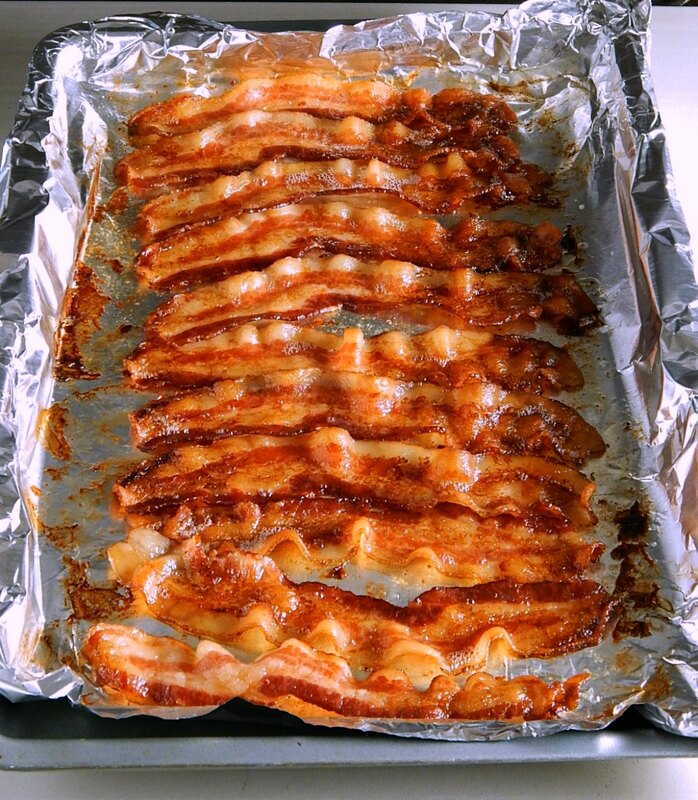 If you want very crisp, lean bacon, place a rack over the baking sheet. Drape bacon, side by side, barely touching but not overlapping, across the tray. Place in oven. Turn oven on to 400 degrees F. and bake to the desired doneness, 14 to 17 minutes. Remember that the bacon will continue to cook for just a bit after being removed from the oven. There is no need to turn, adjust or fuss, unless your oven cooks a bit unevenly, in which case you might want to turn the tray from front to back part way through. If your bacon isn’t very lean, and it looks like the bacon is in danger of completely being covered by grease, it may be drained off midway through the baking. Remove bacon immediately from the tray. Bacon will crisp up a bit as it cools. Place bacon on a paper towel (or whatever you like to drain your bacon on) and blot the top as well. Then, note the time! Now, you’ll have the timing down for your beautifully cooked, no-brainer bacon for any future breakfasts! Any fat can be easily drained off the tray by adjusting the foil in a corner into a “spout” or the grease may be left behind to harden on the foil, folded up and discarded. I will be bringing Oven Baked Buffet Style Bacon to Throwback Thursday, No. 17, where I’m honored to be a co-host as well as to Fiesta Friday number 98, with two brand-new co-hosts, Sadhna @ Herbs, Spices, and Traditions and Natalie @ Kitchen, uncorked. Make sure to stop by and check out all the posts, and please do contribute one of your own! See you there! This entry was posted in Click here for Fabulous Food Posts and tagged Bacon, Breakfast or Brunch Dish, Frugal Hausfrau, oven baked bacon. Bookmark the permalink. I’ve never saved the bacon grease to cook with it later. How long does it keep, and what kind of container do you store it in? Here is a tip for you from a 90 yr. old in SC. I met her in 1993 and she cooked bacon this way and along side of it put in a pan of floured sliced green tomatoes!! You flip them over at the same time. When about done she slipped in her bread to toast slightly, added a little mayo for bacon and fried green tomato sammiches! She knew how to eat!!! Bless her heart, she’s gone now, but I will always remember to cook my green tomatoes and bacon at the same time! Hi Violet- so glad you stopped by to comment! We are just putting in our tomatoes and as usual, probably overdoing it, lol! I can’t wait to try this as I’m quite sure we’ll have an abundance of green tomatoes to use up this fall before the frost hits!! Great! Love your site!! Also, try this on a burger! I think Applebee’s does this on one of their signatures…. Thanks, Violet. Maybe with cheese and that Sweet Bourbon Barbecue Sauce I posted last week. Although I have to say I had a sandwich at Applebee’s – three porks, oh was it GOOD!! My mom read the oven cooked bacon idea in a Heloise column eons ago and I thought if Heloise suggested it the whole world used the idea!! The bacon sizzles in the oven but does not splatter at all. I put my bacon on a rack in a pan with sides, it makes the bacon crisper. Don’t forget to save that wonderful bacon grease!! I’ve seen a few posts like these, and I think it’s a great idea, but I’ve often wondered if this would cause splatters in the oven? Even though we have a self-clean gas oven, I just still seem to get stains from the previous cycle. It’s very strange, but I’ve never had it spatter anywhere. I guess maybe because it cooks more evenly? I was worried, too, the first time I ever made it. I was also afraid I was going to have to take a spattering tray full of bacon and grease OUT of the oven, but it just doesn’t seem to spatter. I agree with you! Baking is the way to go. No mess and you don’t torch the bacon. Sounds interesting. …can’t bet the taste though…. Hi Mollie, I often bake my bacon but I am always cooking it by feel. Now I have a guide. Also like the egg recipe. Yeah we made 200 links this week. These look so delicious…it’s a pity I have never tried any form of pork yet! What temp do you bake the bacon? Fab idea. I like turning a package of bacon into a compact stack of bacon sticks that I can put into a container and freeze for when I want a few slices without the work. I freeze bacon all the time and slice across the package when I want just a few for bacon bits, but it doesn’t sound like that’s what you’re talking about. Yes, I cut the entire package in half cause I prefer half strips and bake the bacon as you do. Then I toss the drained cooled cooked bacon into a tupperware container and freeze it. I keep a small container of the bacon fat in the fridge as well for sauteeing the onion when I’m cooking chowder etc. I have to try that, what temperature do you bake the bacon on? Lol yes I really do read almost every post I look at. Making the bacon in the oven changed my life, love it!! Did it today and the bacon came out perfectly and I didn’t have to babysit a fry pan!! I’m SO glad to hear it! And no stovetop spatters!! 🙂 🙂 Merry Christmas to you Suzanne, and Gibs and I will be thinking of you! Thanks, Emmi! I tolk my folks that’s why it’s called bacon – for Bake On, but they didn’t believe me!! 🙂 I didn’t know you could bake sausages, but I imagine you’re an expert at it!! I will try it next time – do you pierce them and then bake them?